Join Us on July 7th at Gwynn Oak Park! If you grew up in Baltimore, you may have ridden on the roller coaster at Gwynn Oak Amusement Park on Report Card day or danced at your prom at the Dixie Ballroom. Or you may have been one of those who was denied entry because of the color of your skin. Fifty years ago this summer, during the week of July 4-7, 1963, hundreds of people gathered at Gwynn Oak Amusement Park for a non-violent protest against its segregation. Nearly 400 were arrested and the attention of the nation was soon focused on this injustice occurring in Baltimore. Marching side by side and arm in arm were whites and blacks, priests, rabbis, ministers—and members of their congregations—businesspersons, union members, students, teachers, men, women, and children. Many were not the targets of discrimination themselves. Yet they left their comfortable homes and took time out of their busy lives to join the struggle-to be yelled at, jeered, spit upon, beaten, and arrested. Baltimore County Executive Spiro T. Agnew finally negotiated an agreement with the park owners and the protestors. On August 28, 1963—the park’s first day without segregation—a little girl named Sharon Langley became the first African-American child to go on a ride there, taking a spin on the merry-go-round. 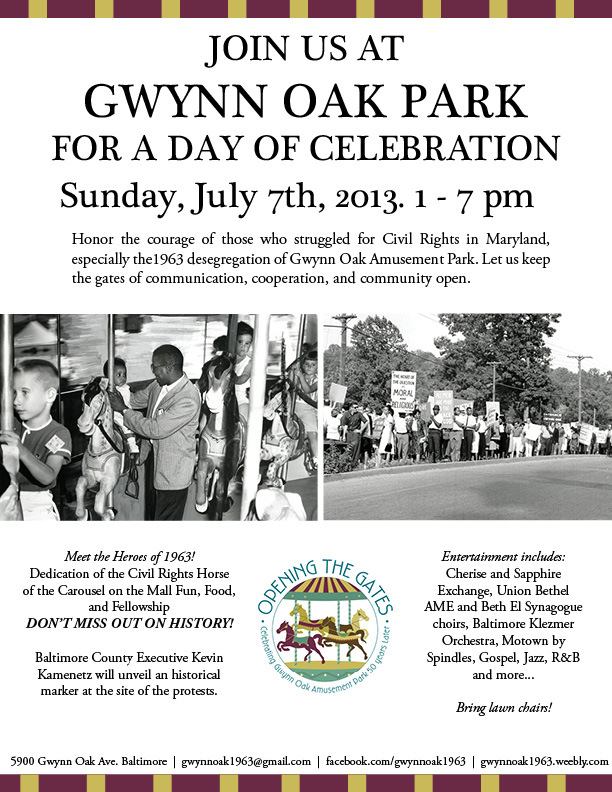 On Sunday, July 7, 2013, citizens of Baltimore and surrounding areas will celebrate the 50th Anniversary of the integration of Gwynn Oak Amusement Park. Baltimore County Executive Kevin Kamenetz will dedicate a special plaque commemorating the Golden Anniversary of the Park’s desegregation and honoring those who courageously stood up against injustice. This family-oriented event, Opening the Gates: Celebrate the Gwynn Oak Amusement Park 50 Years Later, is being hosted by a coalition of clergy groups, churches, synagogues, media, private companies, community organizations, and concerned individuals. It will be a festive Sunday afternoon celebration, free to the public, with diverse entertainment, activities, food, vendors, speakers and more. July 7th will bring together citizens of all religious, racial and ethnic backgrounds to celebrate our community’s diversity.